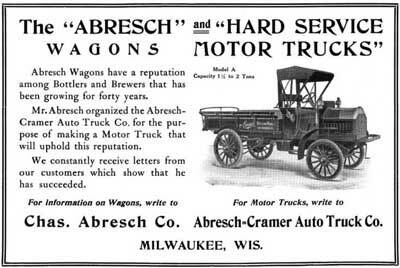 Abresch was a well-known Milwaukee manufacturer of brewery wagons and from 1910 to 1912 produced small numbers of the heavy-duty Abresch-Cramer truck for the same group of clients. 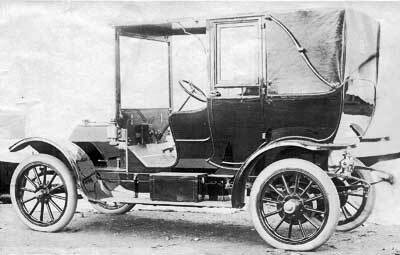 Automobile bodies were also produced for regional manufacturer such as the Fawick, Great Western, Kissel, Mitchell and Rambler. 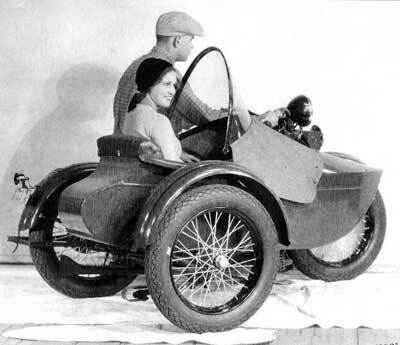 Abresch was Milwaukee’s Kissel Kar distributor and constructed a small number of custom bodies on early Kissel chassis. 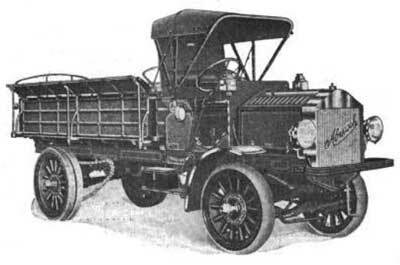 In addition to producing its own commercial bodies Abresch installed and distributed Hercules truck bodies and in later years survived as an automobile body repair facility. Abresch’s main claim to fame lies with the Harley Davidson and Goulding Mfg. 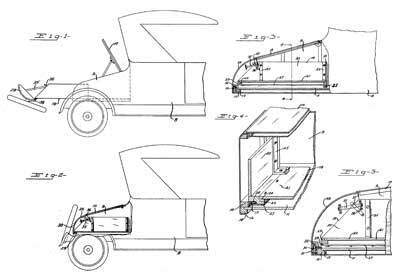 Co. for whom it constructed sidecar and van bodies from the 1920s into the 1960s. 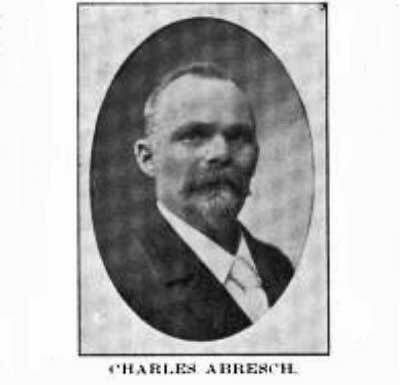 Charles Abresch, its founder, was born on May 12, 1850, in Dierdorf, Neuwied, Rheinland-Pfalz, Germany to Louis and Elizabeth Schneider. Charles mother Elizabeth died when he was but a few months old and he and his older brother William (b.1844 in Dierdorf-d. 1879 in Milwaukee) were placed in the care of their aunt, Christine Schneller. Charles father Louis, a trained carpenter-joiner, emigrated to the Unites States in 1854 and found employment with one of the city’s builders. Charles and William remained in Germany in charge of their aunt Christine, who apprenticed Charles to a local blacksmith and William to a carpenter. After completing his training in 1868 Charles joined his father in Milwaukee, accepting a position with John Meinecke’s wagon and carriage works - William found a carpentry position nearby in Kenosha, Wisconsin. Coincidentally their first cousins, Louis and William Schneller (Christine Schneller’s sons) emigrated to Milwaukee at about the same time, and may have travelled together. Charles’ father Louis re-married shortly after his arrival in Milwaukee (to Elizabeth Leibrecht – b. 1833 in Bavaria) and his second union was blessed with the birth of five children; Carolina (aka Lina b.1855), Henrietta (b.1862), Henry (b.1867), Jacob (b.1869) and Elizabeth (b.1871) Abresch, all of whom were either half-brothers or -sisters of William and Charles. Louis Abresch’s household appears in the 1860 (as Appresch) and 1870 (as Abresch) US Census, neither of which include Charles or William. 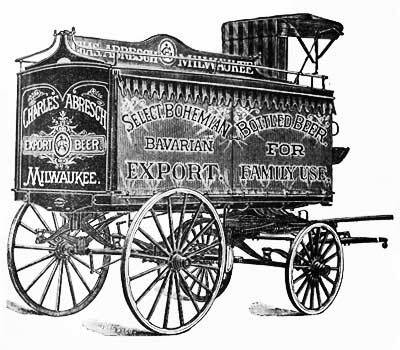 In 1871, only two years after his arrival in America, Charles Abresch started a small wagon works of his own in the style of Second Ward Carriage & Wagons Works, C. Abresh, proprietor. In 1873 Abresch married Katherine (nee Gerard, b.Dec. 25, 1847 in Jackson, Wis. – d.Jun. 8, 1926) and to the blessed union was born a daughter Amanda (b. 1876 m. Oscar Bach) Abresch. 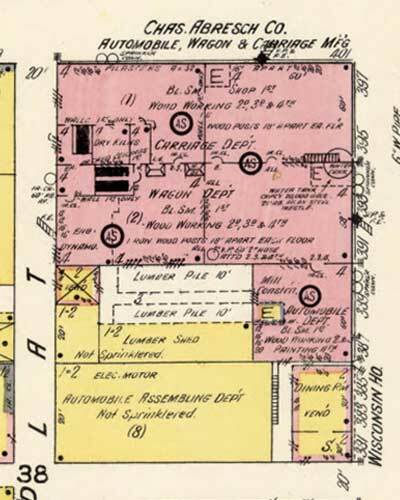 In 1884 the firm was organized as a stock company with Abresch, president; Andrew Hofherr, vice president; Harry P. Ellis, secretary and treasurer; and his fist cousin, Louis Schneller Jr., plant manager. 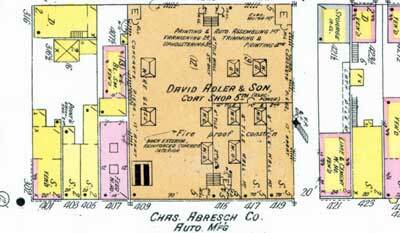 Andrew Hofherr was a well-known Milwaukee cigar maker (A. Hofherr, Cigars; 620 Fourth Street). 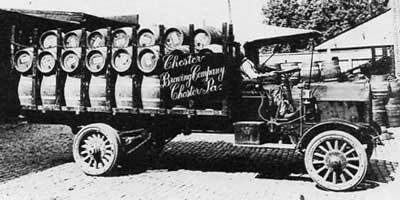 “CHARLES ABRESCH COMPANY; Builders of Fine Delivery, Express and Truck Wagons; Nos. 407 to 415 Poplar Street, and Nos. 392 to 398 Fourth Street. 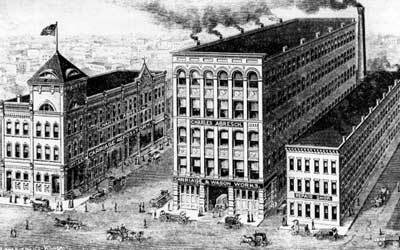 “MILWAUKEE, Wis., April 14.— A fire which started in the Charles Abresch carriage factory, at the corner of Poplar and Fourth streets, at 10 o'clock yesterday, was still burning at midnight, and threatened to destroy the greater portion of the block in which the factory is located. The fire started in the engine room of the factory, which was a six-story brick building. The wind was blowing at the rate of thirty miles an hour at the time. “The fire spread like lightning, and it was only a few seconds before it leaped through the windows of the sixth story. “The factory was in the midst of a semi-residence district, and over twenty families were, driven from their homes. The smoke was so dense that they could not stay to save anything, and it was with the greatest difficulty that the insurance patrol could get into any of the neighboring buildings to cover the furniture. 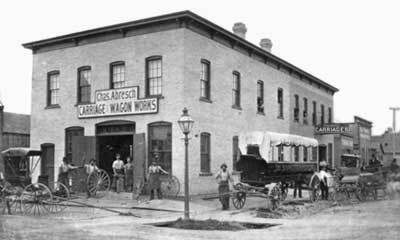 “The Abresch Wagon Works Almost Completely Destroyed by Fire. “A sight that the people of Wisconsin have never before witnessed will be seen at the state fair next week. 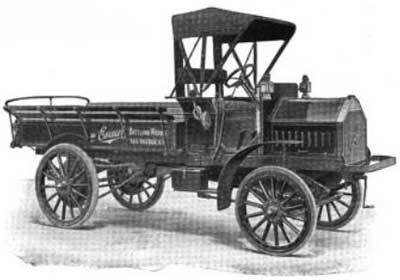 Among the automobiles to be exhibited will be a new one that has just been built by the Charles Abresch company and which is now being tried in Chicago. This machine makes thirty miles an hour and it is to be pitted against the big trotter, King Allar, in a series of races, the first race of the kind ever held in this state and one of the few of its kind ever held. “Waterloo Man Forms a Company With $1,000,000 Capital. “Company Will Manufacture a New Automobile Motor. “The Invention of W. F. Davis, Formerly of This City. “W. F. Davis, formerly vice president of the Davis Gasoline Engine Co., of this city, is now in Milwaukee where he was induced to go by some enterprising Milwaukee man, and has formed a company with $1,000,000 capital stock for the manufacture of a new automobile motor which Is said to be the best thing of the kind yet offered to the public. “Within the month it will be known in the land that the erstwhile modern automobile has brought Milwaukee again to the fore, for this city is soon to be the center of the automobile industry in the United States. “Some three weeks ago there came to this city a man from Iowa whose fertile brain had overcome the obstacles which have heretofore hindered the general use of the horseless carriage and at present one of the largest wagon concerns in the city is busy getting out the first machine, which will be put on exhibition some time in December. 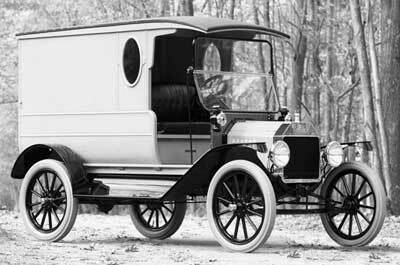 “The automobiles now in use weigh 1,800 to 2,400 pounds, while the invention of the Iowa man, W. F. Davis, weighs only 75 pounds and can be attached to any vehicle now drawn by a horse. More than that, it is capable of reaching a speed of fifty miles an hour, and its cost will be so small that it will be within the reach of everybody. “Owing to its extreme lightness, the cost of propulsion will also be greatly reduced, and the fact that a stock company backed by $1,000,000 is soon to be formed in this city to manufacture the new machine and put it on the market indicates that it is all the inventor claims for it. “W. F. Davis, formerly vice president of the Davis Gasoline Engine company of Waterloo, Ia. 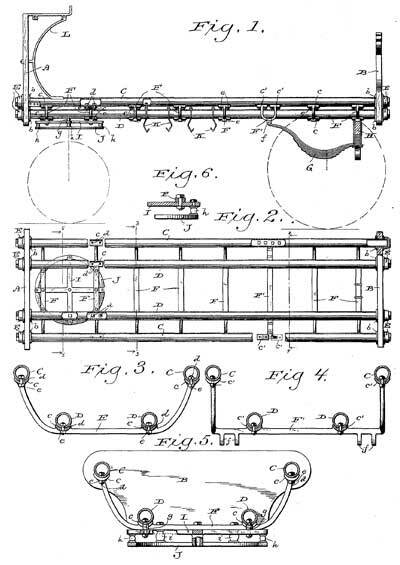 ; inventor of the new auto, is very well known among machine men as the inventor of the Davis gasoline engine. Some nine months ago he sold out his interests in the Davis company and devoted his time to the perfection of the new machine, which has now been finished. Capitalists in Kansas City made him flattering offers to locate there to manufacture his new invention, but through the influence of J. 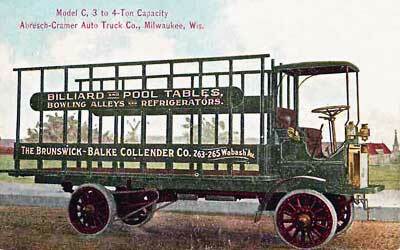 A. Warnken, of Milwaukee who was employed by the company as a traveling salesman, he was induced to locate here. 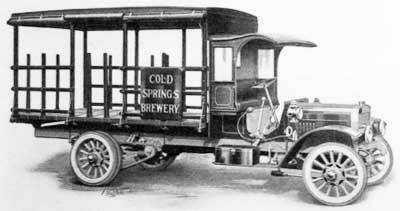 “The Charles Abresch company, wagon manufacturers, of 398 Fourth street, became interested in the plan and have since come into possession of the right to manufacture the new vehicles, paying a considerable sum and a royalty besides. “For three weeks Mr. Davis has been busy at the Abresch plant building the first machine, and within a month a public exhibition will be given at which makers of automobiles all over the world will be challenged to compete. 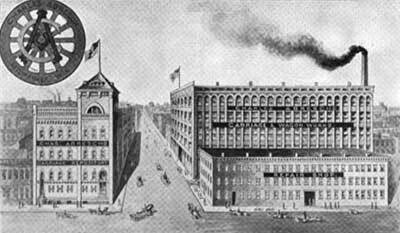 “Although the plans of the inventor and the Abresch company have been carefully kept from the public, several prominent Milwaukee capitalists have been approached with a view to forming a corporation for the exclusive manufacture of the motor, and the matter has so far progressed that backing to the amount of $1,000,000 is said to be in sight. The name of the man who will be at the head of the new corporation is known to The Journal, but cannot be made public at this time. However, he is so well known throughout the United States that his name in connection with the new manufacturing enterprise insures us stability at the outset. “Mr. Davis has moved to this city with his family and will remain to take charge of the manufacture of his invention. The Davis-designed car debuted as the Abresch, a 2,300 lb. 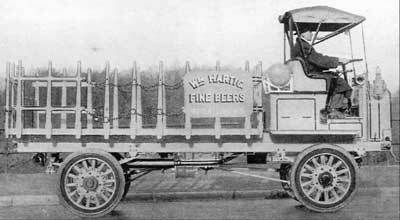 7-passenger high-wheeled brake powered by a Davis-designed 10 h.p. 2-cylinder water-cooled engine that transmitted power to the rear wheels via chain drive. The Abresch used a belt-driven differential whose jackshaft turned bi-lateral sprockets connected by chains to larger sprockets attached to the inside of each rear wheel which revolved around a dead rear axle. A single prototype was constructed before the plan was abandoned. 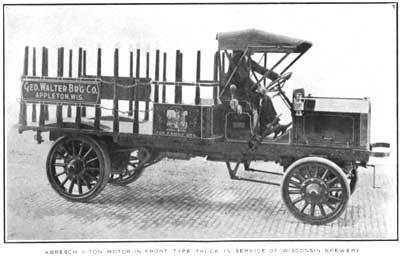 “As a result of a disagreement between the Carriage and Wagon Builder’s association of Milwaukee and the Carriage and Wagon Workers’ union, the wagon works of Charles Abresch & Son and Theodore Habhegger are working with short help and there is prospect of a general strike among the carriage and wagon workers of the city. “Wall Falls On Members of Milwaukee Department. “(By Associated Press.) 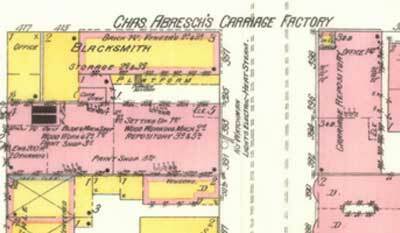 - Milwaukee, Wis., Dec. 31.—The entire plant of the Charles Abresch company, carriage manufacturers, at 392-398 Fourth street, was destroyed by fire at an early hour today, entailing a loss of upwards of $100,000. The fire was first seen in the repair shop in the rear of the main building and spread so rapidly that the firemen were unable to save a single carriage from the main building and t is on these goods that the loss will probably be the heaviest. The building and contents were partially insured. The Abresch plant was partially destroyed less than two years ago. 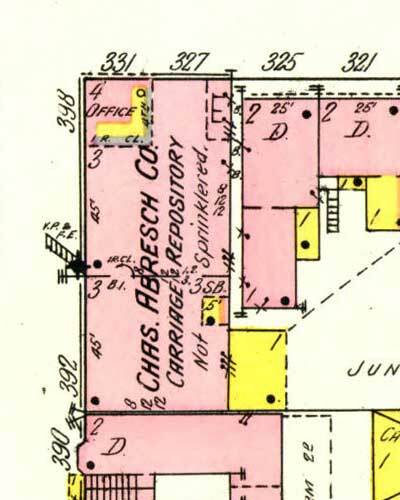 “We take pleasure in exhibiting a cut of perhaps the finest wagon factory building in the country, that of the Charles Abresch Co., of Milwaukee, Wis. The building is of brick, four stories high with stone foundation, 100 feet long and 150 feet deep. It is lighted throughout with electricity and is heated by the hot air fan system of heating and ventilating. The stock room occupies the whole of the basement, which, with the cement floor and well-arranged racks, looks like a good sized wagon hardware store. The first floor is taken up with the engine, the electric tire welding and hydraulic tire setting machines, gas tire heater, shearing and punching machines, and 15 blacksmith fires, worked to their utmost capacity. “The wood shop occupies the whole of the second floor the south half containing the latest improved wood working machinery and the north half 24 wood workers benches. 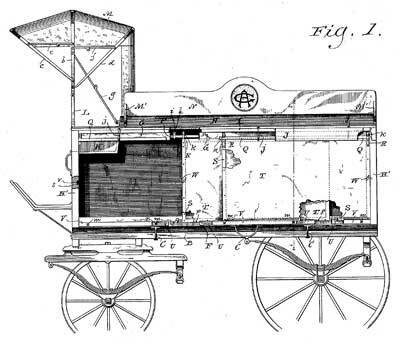 The Abresch wagons, known throughout the country as 'built to last,' owe this reputation to this same body shop and the company is receiving orders daily for automobile bodies, even in as large numbers as 500 lots. “The entire third floor is where that most important part 'painting' is done. 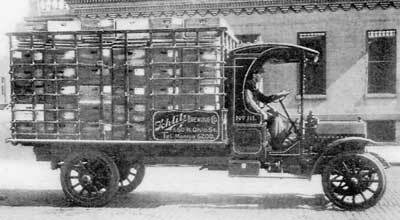 The Abresch Company probably takes more pains in the striping, lettering and finishing of their wagons than does any maker, using but the highest priced colors and employing only skilled labor. “Fawick first considered calling his new car the Silent Sioux. However, he changed his mind and named it the Fawick Flyer, a name retained for all later models. 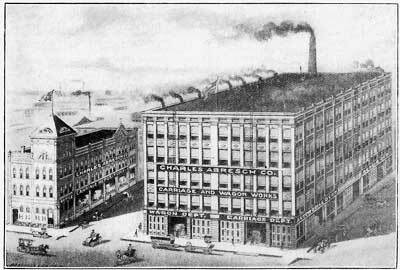 Nevertheless, a Silent Sioux Automobile Manufacturing Co. was listed in the 1910 Milwaukee City directory. It was located at 726 National Av. (an address that would now be in the 1500 block of N. National) and the company officers were listed as R.J. Wells, president; G.W. Burnside, vice-president; and B.S. Wells, secretary. Fawick explained that the corporation had been formed at the suggestion of Burnside, who remained a lifelong friend, and R.J. Wells, an attorney. He does not remember B.S. Wells. The procedure may have been suggested because of Fawick’s youth – he could not have been more than 21 at the time – but he adds: ‘I went along with this for only a short time when I realized that this was really not the correct way for my interests.’ And the company was dissolved. Fawick later found limited success as a tractor designer after which he made his fortune in the automotive parts business as a clutch manufacturer (Fawick Corp.) in Cleveland, Ohio. 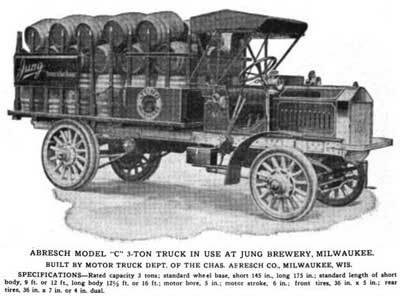 “Long experience in heavy horsed vehicle construction has been turned to account in the production of the Abresch auto truck by the Abresch Cramer Auto Truck Company of Milwaukee, Wis. One of the standard 4-ton trucks of this company was delivered to a Wisconsin brewer is shown in the accompanying engraving. 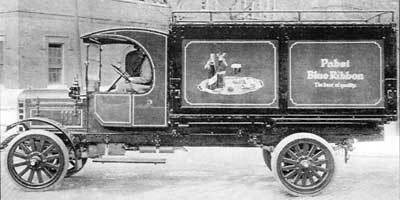 “This machine is of the gas motor-in-front type, but the builders also put out similarity constructed trucks of the same capacity with motor-under-seat so as to give increased loading space where the latter is required. 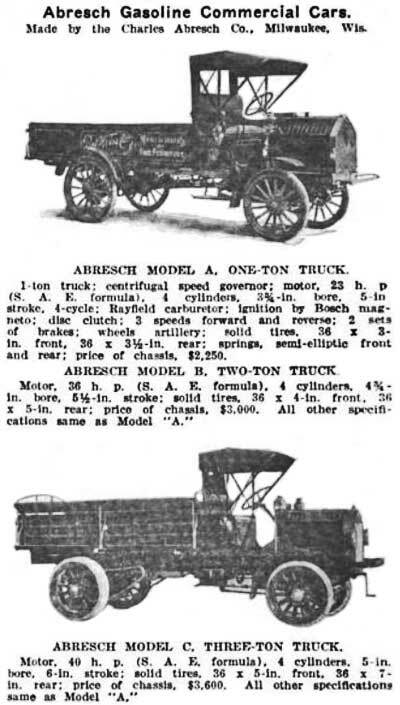 “The Abresch truck is built along standard lines of motor vehicle practice. The outstanding feature being the large rear wheels, 42 inches in diameter and the flexible spring support; full elliptic in front and platform in the rear. In the 4-ton truck the motor is of the four-cylinder vertical. T-head, water-cooled type with cylinders 4 ¾ - inch bore and 5 ½ inches stroke. Rated at 36-40 horsepower. Details of the motor include: Cylinders cast in pairs; four ring piston; I-section connecting rod; drop-forged crank shaft, heat-treated and ground; nickel steel interchangeable valves; bearings fitted with Parson's bronze of bushings. Lubrication of the motor is insured by force feed, and water circulation is positive by gear pump driven from the cam shaft. Ignition is by gear-driven magneto with non-vibrating coil and dry cells as auxiliary. Two sets of spark plugs are fitted. A Stromberg, water-jacketed, carbureter is used. The clutch is of the multiple disc type running in oil. Speed changes are affected by a three-speed gearset in which the gears are always in mesh, engagement for the different speeds being effected by dog clutches. The gearset gives three speeds forward and reverse. The differential and countershafts are mounted integrally with the change-speed mechanism, and final drive is by 1 3/4-inch pitch roller side chains. 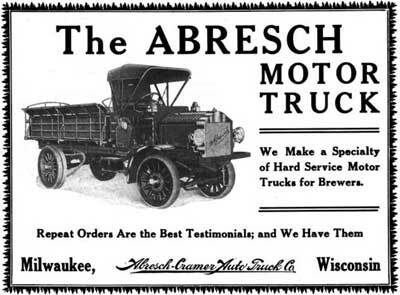 “The Abresch-Cramer Auto Truck Co., of Milwaukee, a corporation recently formed to take over and develop the motor truck department of the Chas. Abresch Company, for forty years wagon and carriage builders and now one of the largest manufacturers of automobile bodies, is making excellent progress. The company now occupies its new home in the five-story reinforced concrete Stehling Building at Third and Poplar streets, Milwaukee. The building has dimensions of 125 by 150 feet and is one block from the Abresch works at Fourth and Poplar streets. The capacity at this time is 100 trucks a year, but this will shortly be doubled. “Seven Walk Out and General Tie-up of Plan is likely Unless Workers and Employers Reach Speedy Agreement. “The Strike in the Abresch automobile factory has reached a stage when it is likely that more employees will walk out this week. “Wednesday morning the strike leaders said that seven painters quit Tuesday because they had been put on a piece system basis and that it was likely all the painters would walk out within the next few days. They say the upholsterers will also strike if the body makers are not given their demands. “The carriage and wagon makers will meet Friday to discuss the advisability of calling out the other workers to strike in sympathy with the carpenters. “Because of the strained condition of the treasury at Milwaukee, Wis., the request of Fire Chief T. A. Clancy for a motor fire steamer has been laid over until next year. The apparatus is desired for use in the residence districts, where stations are far between. 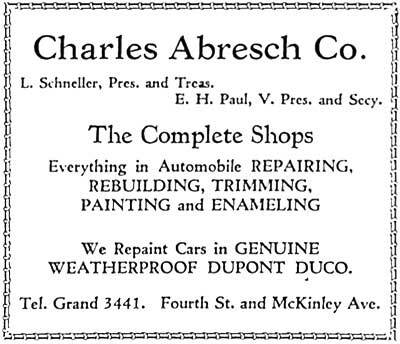 “Charles Abresch, president and treasurer of the Charles Abresch company, manufacturers of wagons, automobiles and trucks, died at his home, 2124 Chestnut street, Saturday afternoon. “The death was expected, his illness lasting three months, and his wife, daughter, Amanda (Mrs. Oscar Bach), and half sister, Mrs. Charles Arnold were at his bedside when he died. “The funeral services will be held at the home on Wednesday at 2 o’clock. Interment will be in Forest Home Cemetery. “About one month ago Mr. Abresch was removed to the Battle Creek sanitarium, Battle Creek, Mich. but he grew worse and was brought to the Sacred Heart sanitarium, Milwaukee. All of the best medical aid possible was given him, but he was removed to his home two weeks ago and death was expected at any moment. Dr. L. Daniels was his attending physician and was with him at the end. “Charles Abresch was born on May 12, 1850, in Dierdorf, province of the Rhine, Germany. His mother died when he was but a few months old and his father soon after came to America. The infant was left in charge of his aunt, Mrs. Christine Schneller, mother of Louis and William Schneller of Milwaukee. “When 18 years old, Mr. Abresch followed his father to the United States and met him in Milwaukee. He had learned the blacksmith trade in Germany and was given employment at the John Meinecke wagon and carriage works upon his arrival here. “At the age of 20, and only two years after his arrival in America, he started a small wagon works of his own, and through steady and persistent work he built up one the largest plants of its kind in this country. “In 1894 the company was capitalized for $220,000 and now more than 800 persons are employed in the factory at Fourth and Poplar streets. The manufactured of automobiles and trucks was taken up five years ago and the output is now being sent all over the United States and Mexico. “Eight years ago the entire factory was destroyed by fire, but was rebuilt at once on a much bigger scale. “The other officers of the company are Louis Schneller, vice president and manager, and Edmund Paul, secretary. “In 1870 Mr. Abresch married Miss Catherine Gerard of Jackson, Wis., and one daughter, Mrs. Oscar Bach, was born. Two half-brothers, Henry and Jacob Abresch and two half-sisters, Mrs. Charles Arnold and Mrs. John Andres Johnson, all of Milwaukee, are his other near relatives. His father died in 1887. “Mr. Abresch spent hundreds of dollars yearly to aid the needy, but he never permitted his deeds to be made public. While not active in politics, he took a keen interest in public affairs. “He has twice returned to his old home at Dierdorf, in 1897 and 1906. 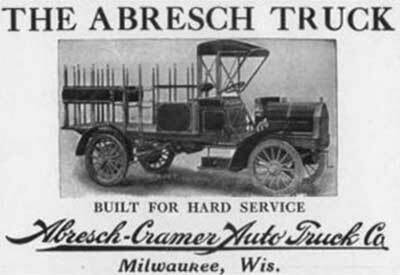 The death of Abresch coincided with the end of the firm’s truck production. Robert Cramer remained active in Milwaukee’s manufacturing circles and around 1920 formed the Cramer Mfg. Co., a manufacturer of oil and water pumps for the automobile industry. 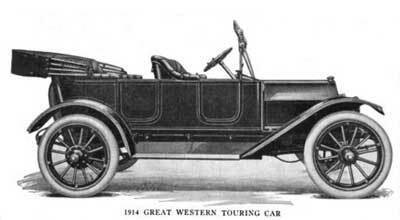 Abresch also built the bodies (roadster, 3 touring cars, sedan) for the Grand Central Palace exhibition of the Great Western Automobile Co. at the 1914 New York Auto Show. 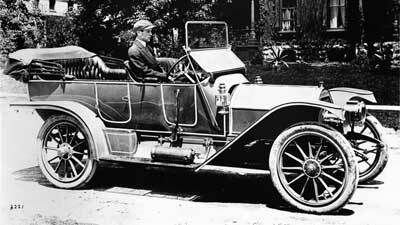 The Great Western was a short-lived automobile manufactured in Peru, Indiana by the officers and directors of the Model Gas Engine Works. “Body Makers' Strike Settled—The strike of more than 200 body builders in the plant of the Charles Abresch Co., Milwaukee. Wis., manufacturer of motor car and truck bodies, has been settled by arbitration and the men are back at work. City Storage & Mfg. Sioux Falls, IA. 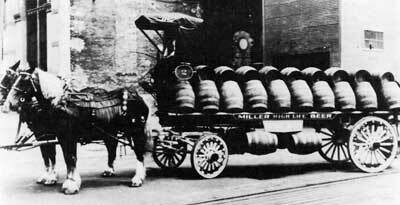 The onset of Prohibition put Milwaukee into turmoil as the city’s economy depended upon the Midwest’s vigorous consumption of alcohol. 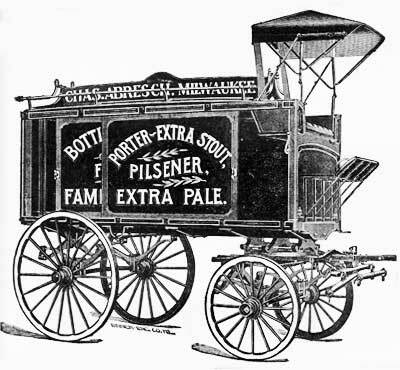 Some smaller breweries went out of business while the major manufacturers - Blatz, Miller, Pabst and Schlitz produced near beer, soda, malt syrup, ice cream, yeast and cheese. 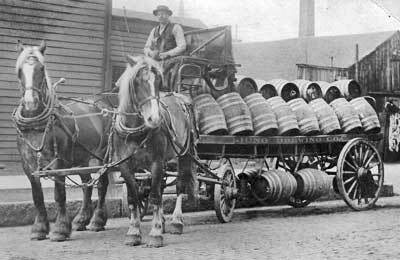 After six years of suffering in 1926 Wisconsin voters approved a referendum amending the Volsted Act (Prohibition) that allowed the manufacture and sale of beer with 2.75 percent alcohol and in 1929 the Severson Act (Wisconsin's prohibition enforcement law), was repealed. In 1932, Wisconsin senator John J. Blaine drafted the resolution to repeal prohibition, and on December 5, 1933, the Twenty-first Amendment was ratified and national prohibition ended. 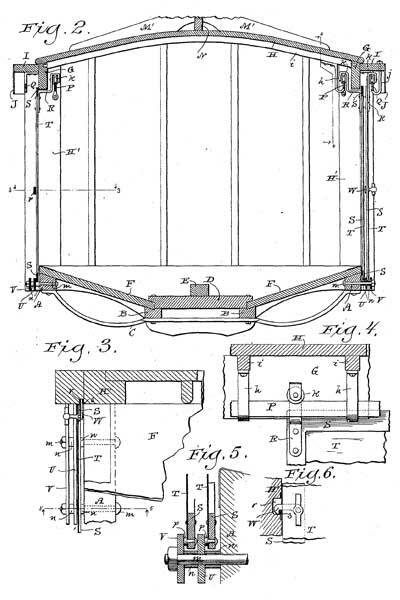 Abresch survived the decade constructing commercial bodies which were supplemented by an occasional order from a regional manufacturer for automobile bodies. 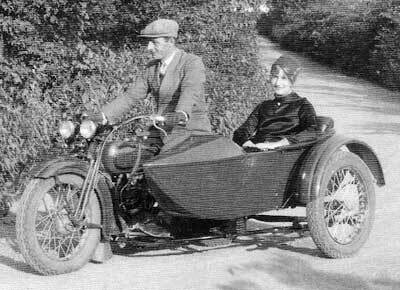 They also had the good fortune to get involved in manufacturing sidecar and van bodies for Harley Davidson and the Goulding Mfg. Co., a third-party sidecar manufacturer. 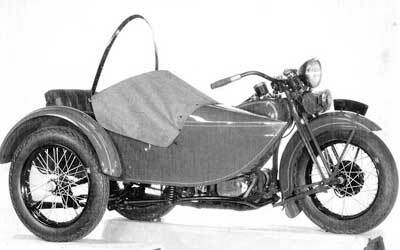 In 1936 Abresch introduced an all-steel sidecar body, and in 1942, Harley’s small and large cargo boxes were replaced with an Abresch-built all-steel intermediate-sized box. 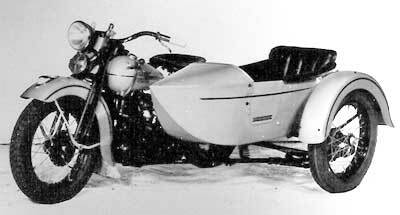 Their relationship with Harley-Davidson continued until 1966 when the firm commenced the manufacture of its own fiberglass sidecar bodies in the former Tomahawk boat plant in Tomahawk, Wisconsin. Abresch survived the Depression by greatly reducing the size of its operations and by the late Thirties auto body repair and refinishing had became its main source of income. “Services are to be held at 2 p.m., Saturday at the Scottish Rite cathedral, 705 E. Wells St., for Louis Schneller, 65, prominent Milwaukee Mason, assistant to Governor Heil. And president for the past two years of the Washington Park Zoological Society. “Mr. Schneller, stricken at his home by apoplexy 10 days before, died Thursday at 1720 N. Hi-Mount Blvd. “He was born in Essen, Germany, and came to Milwaukee at the age of seven, studying at Milwaukee and New York Schools. He was president of the Charles Abresch co., automobile body manufacturing and repair company with which he had been associated for 50 years. “Appointed an honorary colonel by Governor Heil, Mr. Schneller had been one of the most industrious workers for the chief executive dusting his campaign last year and afterward in the early months of the administration.